This card's effect that does something to a Summoned monster other than by this card's effect and Summons a Token Monster afterwards is similar to the first effect of École de Zones. The statue in this card's artwork seems to depict a faun. Scary Moth: If you activate “Monster Reborn” while “Scary Moth” and “Black Garden” are face-up on your side of the field, you will be able to Special Summon a monster with “Monster Reborn.” The effect of “Black Garden” will activate, but will be unable to Special Summon a “Rose Token.” The effect to halve the ATK of the monster will be applied. The application of "Halve its ATK" and the application of "Special Summon 1 "Rose Token" (Plant-Type/DARK/Level 2/ATK 800/DEF 800) to its controller's opponent's side of the field, in Attack Position" are treated as being done at the same time. The application of "destroy this card and as many Plant-Type monsters on the field as possible" and the application of "if the total ATK the destroyed monsters had on the field is equal to that target's ATK, Special Summon that target" are not treated as being done at the same time. On Halving ATKs and the "Rose Token"
When a monster is Summoned, the effect which Special Summons a "Rose Token" and halves the ATK of the other monster begins a chain. : Does the effect of "Black Garden" which Summons a "Rose Token" and halves the monster's ATK begin a chain? 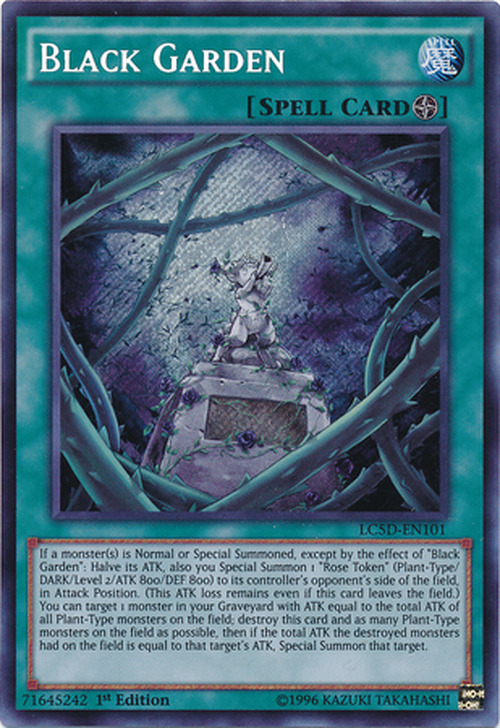 If there is no open Monster Card Zone in which to Special Summon a "Rose Token", "Black Garden"s effect still activates. The monster's ATK will be halved, but no "Rose Token" will be Special Summoned. : Does "Black Garden"s effect activate even when there is no open Monster Card Zone? When "Horus the Black Flame Dragon LV6" is Summoned, the effect of "Black Garden" will still activate. The ATK of "Horus the Black Flame Dragon LV6" will not be halved, but a "Rose Token" will still be Special Summoned. : When the ATK of a monster like "Horus the Black Flame Dragon LV6" cannot be halved, will the effect of "Black Garden" still Special Summon a "Rose Token"? When multiple monsters are Special Summoned simultaneously, "Black Garden" will halve the ATK of each of those monsters. However, only one "Rose Token" will be Special Summoned to the opponent's field. If each player Special Summoned monsters simultaneously, each player will get 1 "Rose Token" each. : When "Black Garden" is on the field, how does it resolve when multiple monsters are Special Summoned simultaneously? If "Vanity's Fiend" is on the field, the effect of "Black Garden" will still activate when a monster is Summoned. No "Rose Token" will be Special Summoned, but the monster's ATK still will be halved. : Will the effect of "Black Garden" activate when you cannot Special Summon a "Rose Token" because of the effect of "Vanity's Fiend"? When a monster is Summoned face-up, if the monster is flipped face-down by the effect of "Book of Moon", when "Black Garden"s effect resolves, the monster's ATK is not halved, but you still Special Summon a "Rose Token". : When resolving "Black Garden"s effect, if the Summoned monster is not face-up, is the effect applied? When a monster is Special Summoned face-down (such as with "The Shallow Grave"), "Black Garden"s effect still activates. The monster's ATK is not halved, but you still Special Summon a "Rose Token". : When "Black Garden" is on the field, what happens when a monster is Special Summoned face-down? If "Black Garden"s effect is no longer being applied (i.e. "Black Garden" is negated or is removed from the field), the monsters' ATKs are still halved. : When "Black Garden"s efect is no longer applied, does the monster's ATK stop being halved and return to the Original ATK? Enraged Muka Muka/Red-Eyes Darkness Dragon: If "Enraged Muka Muka" or "Red-Eyes Darkness Dragon" has its ATK halved by the effect of "Black Garden", then afterwards the monster's ATK does not change, even if the number of cards in your hand or the contents of the Graveyard change. : If you Special Summon "Red-Eyes Darkness Dragon" while "Black Garden" is active, then what does its ATK become? Example: If you have five cards in your hand and you Summon "Enraged Muka Muka", then the effect of "Black Garden" halves its ATK from 3200 to 1600. If there are two Dragon-Type monsters in your Graveyard and you Summon "Red-Eyes Darkness Dragon", then the effect of "Black Garden" halves its ATK from 3000 to 1500. Megamorph: When "Megamorph" targets a monster affected by "Black Garden", "Megamorph" will halve/double the monster's original ATK, not the monster's halved ATK. If "Megamorph"s effect disappears, the monster's ATK returns to its halved ATK. Example: "Blue-Eyes White Dragon" (ATK 3000) is Summoned, and its ATK is halved to 1500. "Megamorph" will make its ATK 1500 or 6000. If "Megamorph"s effect disappears, "Blue-Eyes White Dragon"s ATK returns to 1500. Shrink: When "Shrink" targets a monster affected by "Black Garden", "Shrink" will halve the monster's original ATK, not the monster's halved ATK. During the End Phase, the monster's ATK will return to its original ATK. : When a monster's ATK is halved by "Black Garden", when the effect of "Shrink" or "Megamorph" is applied, what is the monster's ATK? Example: "Blue-Eyes White Dragon" (ATK 3000) is Summoned, and its ATK is halved to 1500. "Shrink" will make its ATK 1500. During the End Phase, "Blue-Eyes White Dragon"s ATK returns to 3000. The player who chooses where to place the "Rose Token" and is the owner of the "Rose Token" is the controller of the monster that was Normal or Special Summoned at the time the effect of "Black Garden" was activated. If "Remove Brainwashing" is activated, then control of "Rose Tokens" that were Special Summoned to the opponent's field is changed to you (the owner). : Which player is the original owner of the "Rose Token"? The Tyrant Neptune: The ATK and DEF of "The Tyrant Neptune" are increased by the printed ATK and DEF of the monster which was Tributed from the field. : If you Tribute monsters like "Zoma the Spirit" or a Token Monster to Summon "The Tyrant Neptune", then do its ATK and DEF increase? Example: If a "Rose Token" (800 ATK / 800 DEF) from "Black Garden" is Tributed for "The Tyrant Neptune", then the ATK and DEF of "The Tyrant Neptune" are each increased by 800. The effect which Special Summons a monster from your Graveyard targets the monster. : Spell Card > Black Garden: With "Black Garden", when do you select the monster to be Special Summoned?" Destroying all Plant-Type monsters is an effect. It is not a cost. This card's last effect destroys all monster on the field, including your opponent's field. "Black Garden"s effect to Special Summon a monster from the Graveyard cannot be activated if "Scapegoat" was previously activated, or if "Vanity's Fiend" is on the field. If you activate this effect of "Black Garden" and "Call of the Haunted" is chained to Special Summon "Fossil Dyna Pachycephalo", then all Plant-Type monsters are destroyed, but no monster is Special Summoned. : When the effect of "Vanity's Fiend" is active, can you activate the effect of "Black Garden" which destroys monsters and Special Summons a monster from your Graveyard? "The combined ATK of the destroyed monster(s)"" means the combined total ATK while the monsters are on the field, including alterations from other effects like Equip Cards. : For "Black Garden", does "the combined ATK of the destroyed monster(s)" mean the ATK while on the field or while in the Graveyard? When "Black Garden"s last effect resolves, if the total ATK of all Plant-Type monsters is not the same as the ATK of the targeted monster, the monster is not Summoned. "Black Garden's" first effect is a Trigger Effect. "Black Garden's" second effect that Special Summons 1 monster from your Graveyard targets. Destroying "Black Garden" and all face-up Plant-Type monsters is not a cost. If a monster Normal or Special Summoned while “Black Garden” is active is flipped face-down, its ATK will no longer be halved. If a monster is Special Summoned face-down, "Black Garden's" first effect still activates. The monster's ATK is not halved, but a "Rose Token" is still Special Summoned. If "Black Garden's" second effect is activated and an effect is chained that removes it from the field, its effect disappears because it cannot be destroyed, and the face-up Plant-Type monsters on the field are not destroyed. If "Black Garden's" second effect is activated and an effect is chained that changes the ATK of Plant-Type monster(s) on the field, the targeted monster in the Graveyard is not Special Summoned, but "Black Garden" and all face-up Plant-Type monsters on the field are still destroyed. The “total ATK” of the destroyed Plant-Type monsters is equal to their combined ATK while on the field. When a monster is Normal or Special Summoned, any Continuous Effects that increase or decrease the monster's ATK are applied before halving the monster's ATK with "Black Garden's" effect. For example, If "Command Knight" is Normal or Special Summoned, when "Black Garden" halves its ATK it also halves the ATK "Command Knight" gained from its effect. If "Burden of the Mighty" is active, the monster's reduced ATK is halved by "Black Garden". If "Black Garden" is removed from the field or negated, the ATK of monsters whose ATK was halved remains halved. If you control "Black Garden", when you activate "Scapegoat" the effect of "Black Garden" will activate after your "Sheep Tokens" are Special Summoned, but its effect will disappear.The latest print of "Black Garden" uses Problem-Solving Card Text, which indicates that the ATK-halving effect will apply even if "Black Garden" cannot Special Summon. If instead, your opponent activates "Scapegoat", after they Special Summon their "Sheep Tokens" the effect of "Black Garden" activates, and when it resolves you will Special Summon the Rose Token. If your opponent Normal or Special Summons a monster while you do not have any open Monster Zones, "Black Garden's" first effect still activates and halves the monster's ATK, but the "Rose Token" is not Special Summoned. If you have a Gemini Monster on the field and you Normal Summon it to change it into an Effect Monster, "Black Garden's" first effect activates. It will halve the Gemini Monster's ATK and Special Summon a "Rose Token" onto your opponent's side of the field. If the Gemini Monster's ATK had already been halved by "Black Garden" when it was previously Normal or Special Summoned, it is halved again. If "Vanity's Fiend" is face-up on the field when a monster is Normal Summoned "Black Garden's" first effect still activates. The Normal Summoned monster's ATK is halved, but the "Rose Token" is not Special Summoned. If "Black Garden" cannot be destroyed (due to "Field Barrier", etc. ), its second effect cannot be activated. If you activate "Black Garden's" second effect and an effect is chained that removes the targeted monster from your Graveyard, "Black Garden" and all face-up Plant-Type monsters on the field are still destroyed, but no monster is Special Summoned from your Graveyard. When either of “Black Garden’s” effects is activated, "Royal Oppression's" effect can be chained. If a monster has its ATK halved by "Black Garden", and afterwards its original ATK is halved by "Shrink", the monster's ATK becomes half its original ATK. When the effect of "Shrink" is no longer applied, the monster's ATK returns to its original ATK. If a monster has its ATK halved by "Black Garden", and afterwards it is equipped with "Megamorph", its ATK will be equal to double its original ATK. If "Megamorph" is later negated or removed from the field, the monster's ATK will return to half its ATK (the same as it was before “Megamorph” was equipped). If "King of the Skull Servants" is Normal or Special Summoned, first its original ATK is set by its effect. When "Black Garden" halves its ATK, it will halve the original ATK, and even if the number of "King of the Skull Servants" and/or "Skull Servants" in the Graveyard changes afterwards, the ATK of the "King of the Skull Servants" remains at the halved value set by "Black Garden". If "Tyranno Infinity" is Normal or Special Summoned, first its original ATK is set by its effect. When "Black Garden" halves its ATK, it will halve the original ATK, and even if the number of Dinosaur-Type monsters in its controller's Graveyard changes, the ATK of "Tyranno Infinity" remains at the halved value set by "Black Garden". If "Black Garden" and "The Wicked Dreadroot" are face-up on the field, when a monster is Normal or Special Summoned its ATK is first halved by "The Wicked Dreadroot", and afterwards its ATK is halved again when "Black Garden's" effect resolves. If you and your opponent Special Summon monster(s) with the same effect, when "Black Garden's" effect resolves the ATK of each Special Summoned monster is halved, and 1 "Rose Token" is Special Summoned onto both you and your opponent's side of the field. If either player does not have an open Monster Card Zone, their opponent still gets a "Rose Token". The player that Normal or Special Summoned a monster chooses which of their opponent's Monster Card Zones the "Rose Token" is Special Summoned into. The player that Normal or Special Summoned a monster is considered to be the "owner" of the "Rose Token". If a monster that is unaffected by the effects of Spell Cards is Normal or Special Summoned, its ATK will not be halved by "Black Garden's" effect, but the "Rose Token" is still Special Summoned. If a monster that is unaffected by the effects of Spell Cards is also a Plant-Type monster, it is not destroyed when "Black Garden's" second effect resolves, and its ATK is not included in the total ATK of the destroyed Plant-Type monsters. If "Black Garden's" second effect is activated and "Call of the Haunted" is chained, Special Summoning "Fossil Dyna Pachycephalo", "Black Garden's" effect cannot Special Summon a monster, but it and all face-up Plant-Type monsters on the field are still destroyed.